Do you remember the back-to-school excitement? Your parents likely took you out shopping for new clothes and new folders, pens, pencils and other supplies. While you couldn’t wait to get out of school in June, you were equally excited (at least temporarily) to go back in August or September. Yet, now, many parents may dread the back-to-school season because of the financial burden. Yahoo! recently reported that the average back-to-school price tag for a high school student is $1,402! That includes the cost of back-to-school supplies, musical instrument rentals, sports and field trips. If the high cost is concerning you, especially if you have more than one school-aged child, there are plenty of ways to save. When it comes to back-to-school supplies, there are several cost-cutting measures you can take. Shop the sales. Target, Walmart, Office Depot, they all offer back-to-school supply sales. Cherry pick the best deals, and you won’t have to pay much for school supplies, especially when you can get notebooks for .05 a piece! Check out the dollar store. Your local dollar store will have school supplies at a fraction of the cost of retail. This is a great one-stop shopping place to go if you don’t have the time to cherry pick sales. Take inventory first. Before you buy any clothes, take inventory. You and your child can look through her closet and see what clothes are still in good condition. You may find you have very little to buy. Stagger your purchases. There’s no rule that says you have to buy all your child’s back-to-school clothes the week before school. Buy some jeans and long sleeve shirts before school. Then, in October or November when the weather cools, buy some sweaters. Stagger your purchases based on need and sales. Buy second hand. Another option is to buy second hand, either through a consignment store or a place like Goodwill. You can also try joining and buying from Facebook groups selling the brands of clothes you like. You’ll save a bundle! Extracurricular activities are important for your children’s development, and in the high school years, participation also helps to round out their college application. Yet, extracurriculars can be expensive! The key is to find ones that your child enjoys and that you can afford. Look for free extracurriculars. Especially when children are younger, look for things that they can do for free. When my son was young, choir was free, but after school gym cost money every month. He joined choir, and then later he also joined Art Club, in part because it was free. Choose one extracurricular. As your kids older, choose one extracurricular activity that they excel at. Have your child focus on that one. Then, you only have one expense to pay versus three if he was on a sports team every season. Have your child become a teacher. Has your child been taking piano since she was five years old? If she now has 10 years’ experience, she could start offering lessons to younger students to help pay for her own lessons. There’s nothing wrong with a high school student helping to pay for her activities and interests. Combine these strategies, and you’ll find your back-to-school expenses are much more affordable. 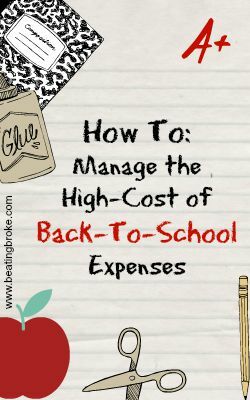 What are your favorite strategies for saving on back-to-school items?